First we preheated the oven, then we mixed all our dry ingredients on a baking sheet. Next, in a saucepan or pot, we then heated up our mixture of olive oil and honey and whisked it together. Don’t heat it up too much, just enough to mix the honey and oil together. Then, pour over your dry ingredients and mix thouroughly. We flattened our granola so it was spread out over the baking sheet (so the granola baked evenly). After waiting about 20-30 minutes, our granola was golden brown. We diced some fruits while the granola was cooling down. Once cool we got some dollops of yogurt with some fruit and sprinkled on some granola for a nice healthy snack. 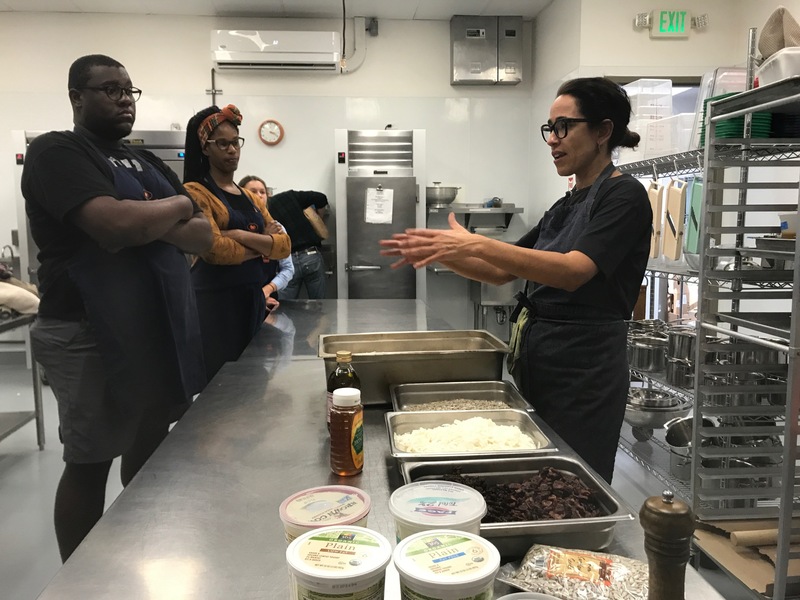 Chef Vanessa spoke about how our breakfasts are the most important meal of the day because what we ingest sets our body up for the day to come. Instead of starting the day of with sugary pancakes or loads of powdered sugar on waffles, we should look to other options. 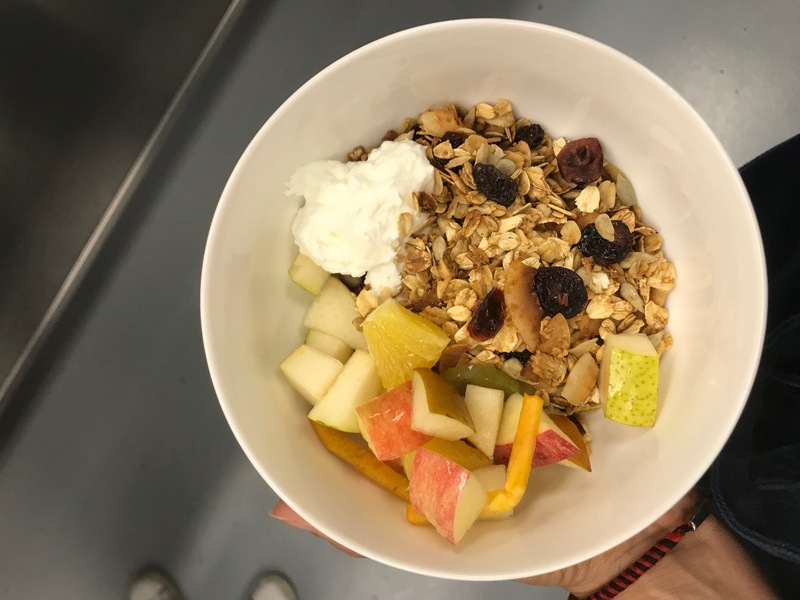 Granola is perfect because it can be made with whatever you want. You will also ingest healthy sugars instead of the processed sugars found in many breakfast foods like some cereals. According to the American Hear Association, women should not exceed 6 teaspoons (25 grams) of sugar in a day and 9 teaspoons (38 grams) for men; children should also range from about 3-6 teaspoons per day depending on their age (Sugarscience the unsweetened truth). The average American intakes about 19.5 grams of sugar in a day, this means that each of us are ingesting an extra 66 pounds of added sugar. This could lead to diseases like diabetes and heart disease. Before you take that next bite out of your poptart, visualize what will go into your next batch of granola. In a large bowl, combine oats, almonds, coconut, and sea salt. Pour oil and honey mixture over dry ingredients and stir very well to coat. Place on a cookie sheet. Bake for 10 minutes; remove from over and stir. Place back in over but remove and stir every 5 minutes or so until the oats are golden brown (approx. 25-30 minutes).